my friend jessica made the long trek up north for lunch this weekend so that she could 1) try out my cooking and 2) meet the bruno. 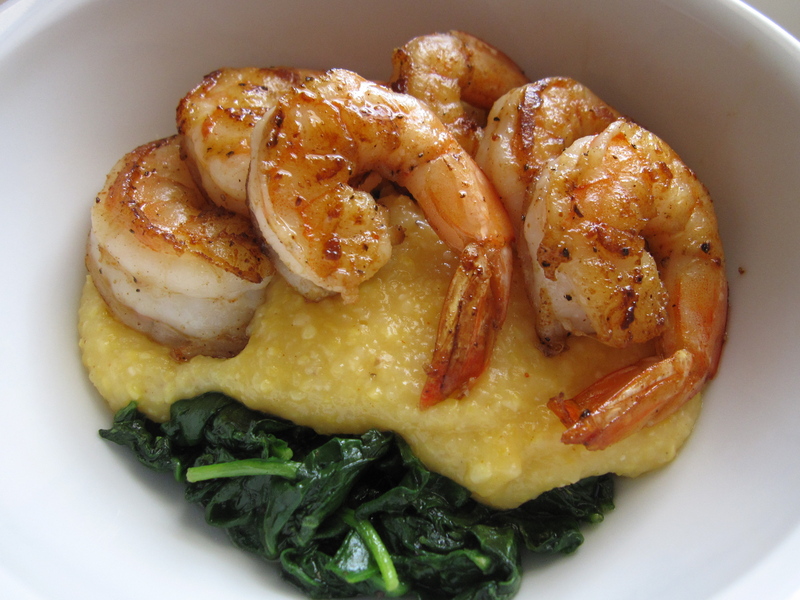 the menu was kept simple: shrimp, grits, spinach, and juice (served in wine glasses, of course). we also made blueberry lemon cake (next post to follow). the shrimp was peeled, deveined, and seasoned with S&P, paprika, cumin, cayenne, and EVOO. sauteed for 2-3 minutes per side. for the grits, i didn’t really follow a recipe and kind of went with the flow. boiled four cups of water, added one cup of corn grits, reduced heat and stirred for 10-15 minutes. seasoning? umm…whatever i felt like putting in. shredded cheddar cheese, S&P, cayenne pepper, butter, nutmeg (why? just felt like it). we had great conversation while we cooked and all the food turned out just delish.